Sipapu Ski & Summer Resort has submitted a master plan amendment to the Forest Service seeking to expand by 924 acres while adding 51 new trails, four new lifts, a mountain coaster and more. This should come as no surprise given the resort’s history, current layout and owner – the collective of southwestern ski resorts known as Mountain Capital Partners. 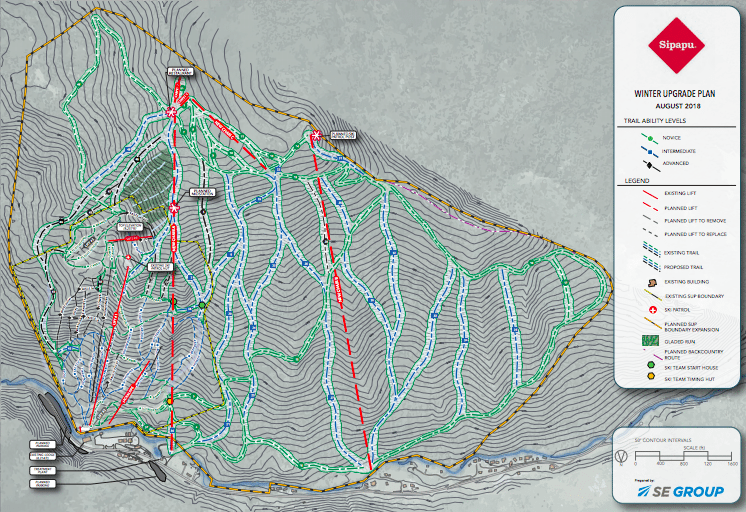 Like with the resort’s accepted 2012 master plan, Sipapu continues to envision two new base-to-summit lifts. Today, it takes two fixed-grip lift rides to reach 9,295′, well below the actual summit of the mountain. Overview of the new winter upgrade plan. A mile-plus long Sipapu Express would rise from the current base area to a new beginner learning zone at nearly 9,700 feet with a second chairlift and two carpets. Because it would operate in both winter and summer for a variety of guests, the Sipapu Express is proposed as a chair/gondola combination lift. Mountain Capital Partners and its managing partner, James Coleman, plan to build a similar lift at Arizona Snowbowl as soon as next summer. A second detachable lift at Sipapu, the Westside Express, would service intermediate terrain in an entirely new pod beyond the current permit area. 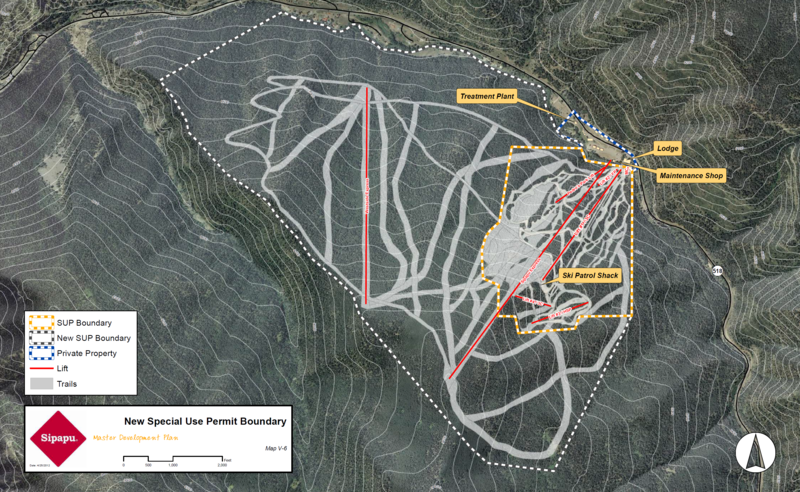 “This lift will provide access to the abundant intermediate fall line skiing terrain that has been identified to address the deficiency of intermediate terrain within the existing SUP Area,” the plan notes. This one would be around 4,400 feet long with a capacity of 2,400 skiers per hour. The plan would also see Lift 1 realigned and replaced with a ift capable of moving 2,400 skiers per hour. Lift 3, one of the last remaining high-speed Pomas in the country, is unfortunately slated for removal without replacement. 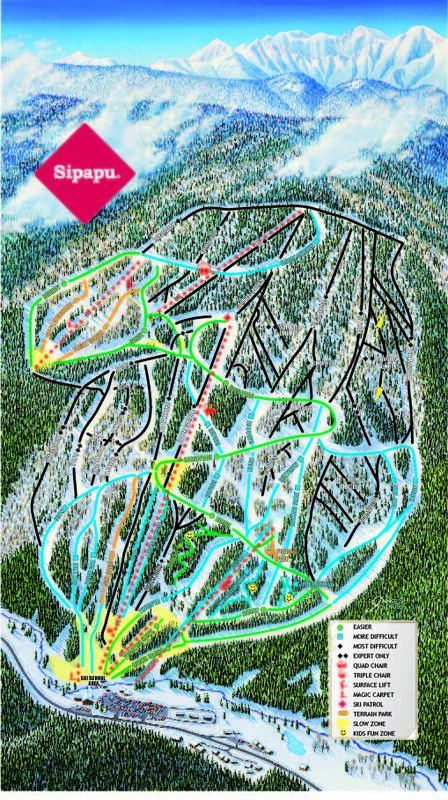 The 2012 plan excluded the summit beginner area and had the Sipapu Express further southeast. With these changes, Sipapu expects to attract 80,000 incremental annual skier visits, hire more workers and positively impact the local economy. The resorts expects a multiyear National Environmental Policy Act review which could lead to new lifts around 2021. That public process kicks off tonight at an open house with GM John Paul Bradley to be followed by more throughout the winter. Good deal for them, glad they are trying to expand and I wish them success! Fun ski hill already, but long overdue for an expansion to include more of the immediate area’s untapped potential. Sure hope this proposal comes to fruition. This is great for Sipapu! Sipapu is a great area that we visit regularly. I too hope all gets approved!